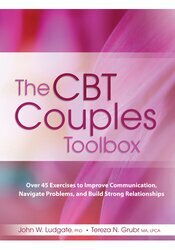 Grounded in Cognitive Behavioral Therapy strategies, along with the best interventions from Dialectical Behavioral Therapy, Mindfulness and Positive Psychology, this will be your powerful go-to resource for guiding couples through challenges, obstacles and opportunities. Filled with 45 unique exercises, assessments, treatment plans and homework to diagnose, tackle specific issues, and keep the therapy moving forward. John Ludgate, PhD, is a licensed psychologist, who has worked as a psychotherapist with individuals and couple for 30 years. He is the author of Heal Yourself: A CBT Approach to Reducing Therapist Distress & Increasing Therapeutic Effectiveness, Overcoming Compassion Fatigue: A Practical Resilience Workbook and many other books, book chapters and journal article. He is currently at the CBT Center of Western North Carolina. Tereza Grubr, MA, LPCA, has worked in the field of mental health counseling for almost 10 years. In addition to receiving training in psychotherapy, Tereza has received extensive training in CBT through the CBT Center of WNC. She has also been extensively trained in positive psychology which she is passionate about and frequently incorporates into her work. Tereza currently works as an outpatient mental health therapist at Family Preservation Services of North Carolina.